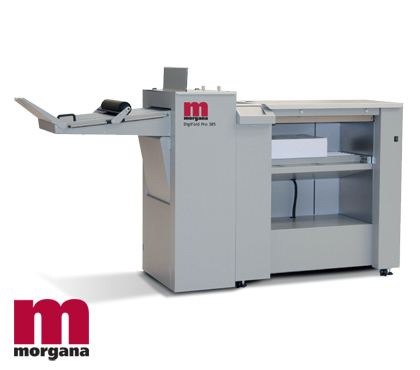 The DigiFold Pro 385, high speed Creaser/Folder with fully automatic setup and deep pile feeder is the latest addition the the Morgana range of folder/creasers. The DigiFold Pro 385 is the latest, fourth generation of the DigiFold series, offering further levels of automation to meet today’s demanding applications. It is specifically designed for digital and litho printers who have a need to crease and fold digitally printed, heavy weight or cross grained stock. The DigiFold Pro 385 is equipped with the very latest in technology to enable automatic set up of jobs, including setting of all feeder functions and fold roller settings, by selecting just a few simple parameters on the Morgana SmartScreen touch screen control. The new deep pile feeder allows stacking of up to 17.72" of paper to enable longer runs and is equipped with a SmartStep table drop for fast loading of shorter run jobs. Size: 89.57” L x 26.78” W x 50” H / Weight: 573 lbs.